Can I get an older version of iTunes to get the App Store back? The latest version of iTunes for Mac removes the App Store which I often use to sync my apps onto my iOS devices. Apps for iPhone, iPad, and iPod touch are now exclusively available in the new App Store for iOS. And the new App Store makes it easy to get, update, and redownload apps—all without a Mac or PC. ... I personally prefer to use my Mac's iTunes to manage apps. 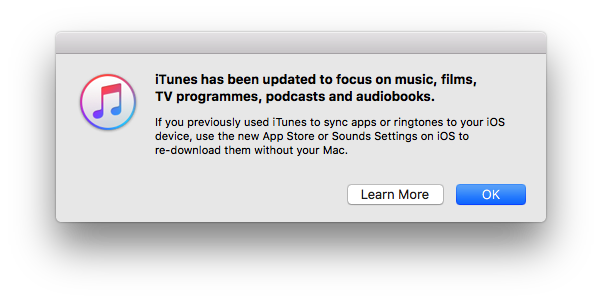 As such, is there any way I can get the previous version of iTunes back? Yes, Apple has released iTunes 12.6.3 which can be installed alongside the latest version of iTunes. Apple released this version specially for Volume Purchase Programs users who may need to use iTunes to install apps. However, regular users can get this version too, if you want to get the App Store back. If you've already installed a newer version of iTunes, you can download this version of iTunes on your Mac, PC 32-bit or PC 64-bit* and run the installer. After installation is complete, you can continue to deploy apps with iTunes. Also, this "special" version of iTunes includes compatibility with iOS 11, iPhone 8, iPhone 8 Plus, and iPhone X and supports both Windows and Mac. Not the answer you're looking for? Browse other questions tagged ios itunes mac windows . How can I automate keeping historical versions of iOS apps on the Mac? Can iPod touch 5th gen use older versions of apps? Is there a way to use fingerprint only for entering the iTunes & AppStore password? Is there a way to use TouchID for iTunes and App store only? Is there a limit to how old a device/iOS version iTunes can backup? Is it possible to load an app onto an iOS 11 device using iTunes 12.6 or earlier? How to download older version of an app for older devices?